Grand Rapids, MI (July 25, 2017) - Vista IT Group, a thirty-year-old national systems integrator, announced it will begin offering free vSphere and vSAN licenses when purchased with select Dell PowerEdge, HPE ProLiant, and Lenovo ThinkServer and System x models. 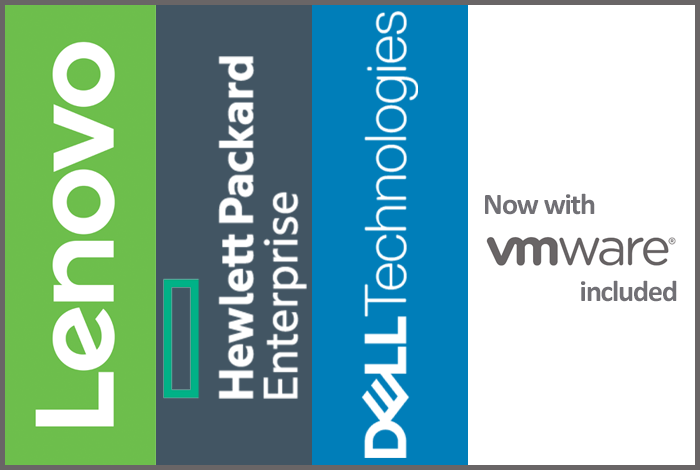 Piggy backing off the momentum from VMware's own 50% off promotion on upgrades from Enterprise to Enterprise Plus, Vista worked with its strategic partners to put this exclusive promotion together. In addition to no-charge vSphere or vSAN licenses and support, customers will also receive 30% off MSRP on qualified PowerEdge R730, R630, ProLiant DL380 G9, DL360 G9, BL460 G9, ThinkServer R450, R350, and System x3550 M5, x3650 M5 server configurations. "These aren't entry level configurations." said Mitch Vruggink, one of Vista's pre-sales engineers. "We've worked with our OEMs to design production ready machines. These systems come with two v4 processors, 256GB of memory, the appropriate VSphere or VSAN licenses and one year of VMware support. "Even better," says Mitch, "we can customize these promotional bundles to meet very specific workload and licensing requirements." Matt Burch, Vista's Sales Manager, goes on to say, "There are a lot of new generation systems coming out with the launch of Intel's new processor. That means customers can take advantage of huge incentives offered by the OEMs to move through their remaining inventory of current generation systems. We've worked hard with our OEMs and distribution partners to come up with what we believe is simply the best packaged VMware server promotion in the market." When asked what was behind the VMware promotion, a spokesperson for the company was quoted as saying; "Vista was an early adopter to VMware. Our customers have repeatedly asked for help to manage all their OEM agreements. With the new asset tracking system we've implemented, we can manage customer licensing contracts, support agreements and maintenance renewals all through a single pane of glass. Now our customers won’t to have to experience any lapses in coverage, return to service charges and can have one convenient renewal date for all the various OEM agreements they are expected to manage these days. This promotion is going to help promote the Vista brand on a national level." Available only through Vista IT, these packages are being offered at discount levels usually reserved for only the largest enterprise customers. Minimum order requirements must be met in order to qualify. For specific program details regarding this promotion contact Vista IT at http://www.vistaitgroup.com or by calling 888.870.8847. About Vista IT Group: Vista IT Group is a national technology provider serving customers in every state representing multiple industry sectors and verticals. Having over 30 years’ experience as a global technology provider, our unique business model serves as a strategic complement to the conventional global information technology supply chain. Possessing warehouse, logistics, and full integration capabilities, our ability to execute is unheard of in today’s industry where most technology providers are leveraging external resources to provide their value propositions to their customers.